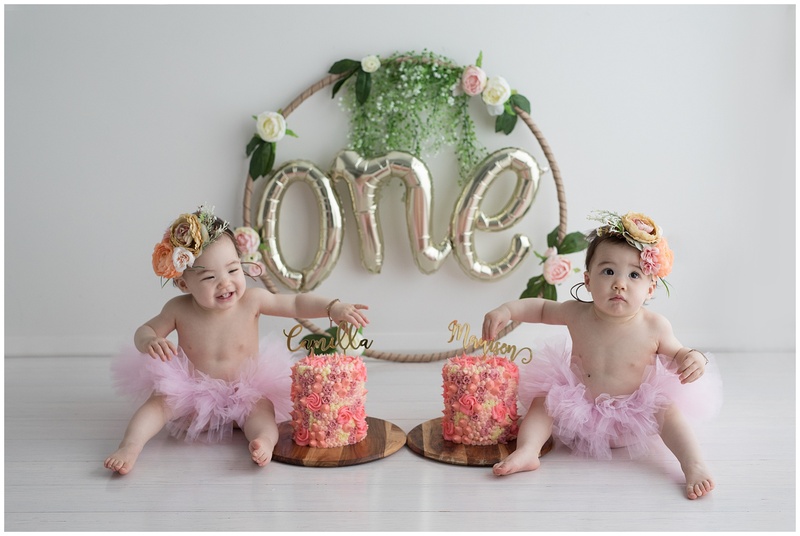 For Camilla and Madison’s first birthday, the amazingly talented Amelia from Cherry On Top Photography generously gifted a cake smash session for the girls. 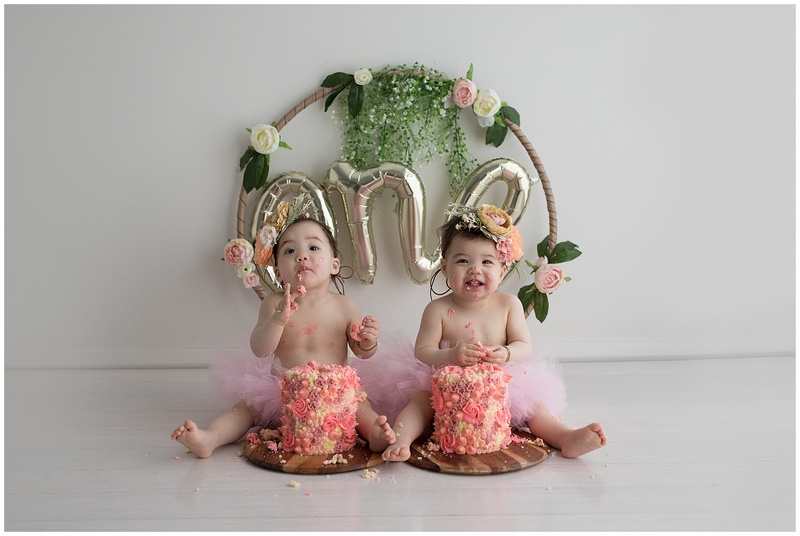 It was the best day ever for the girls having their first taste of cake and icing!! They definitely love cake just like mummy!! 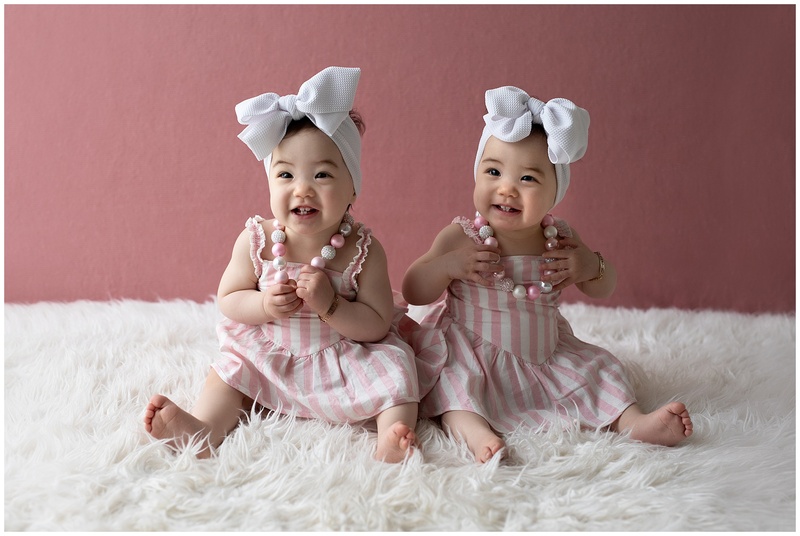 I am soooo IN LOVE with these beautiful photos that have captured the girls perfectly! 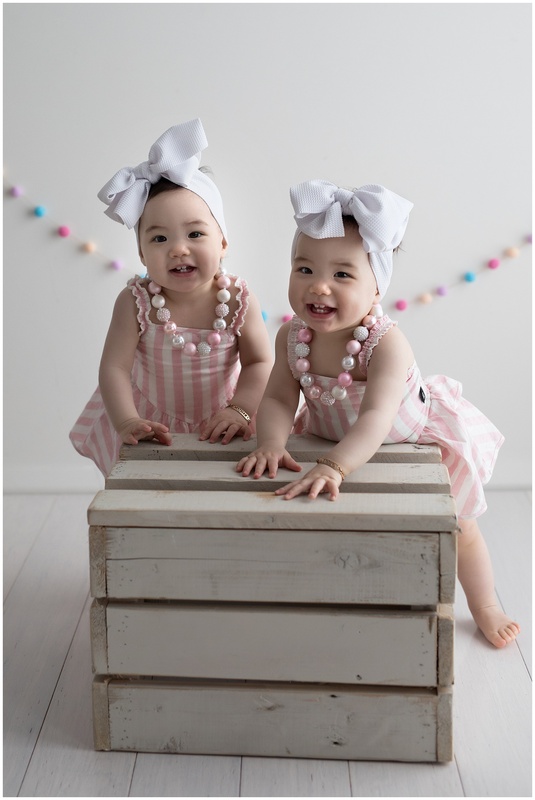 In all the photos it is Camilla (left) and Madison (right). 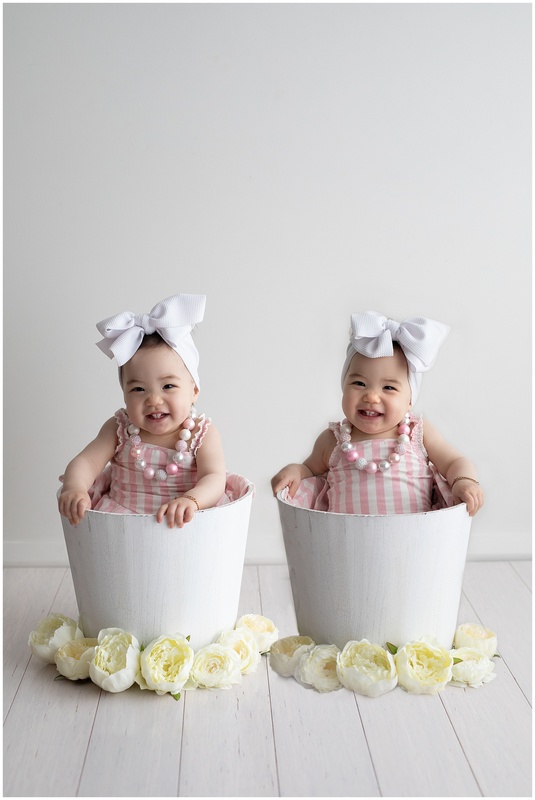 Amelia captured their personalities perfectly and the photos were the first time they had ever sat on their bottom (they only ever sat with W shaped legs before this!). 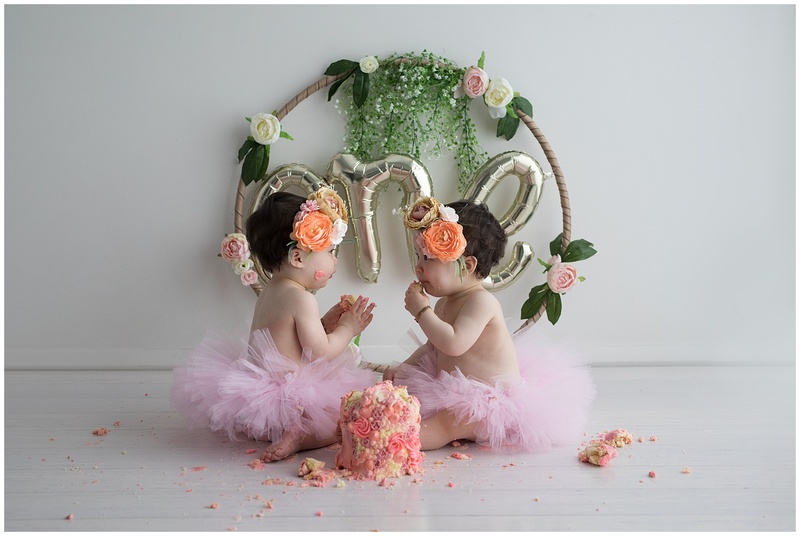 If you are in Sydney, especially in the Hills District area, I highly recommend Cherry On Top Photography! As you can see, Amelia’s photos are gorgeous, she is a natural with the babies and it was such a fun, smooth running and enjoyable session! As much as I love making cakes for my boys, I am over the moon to make OTT girly girl cakes for my girls! The cakes I made for the girls’ smash cake session were using my Perfect Buttercream Icing and Eggless Vanilla Cake recipes. For the buttercream I used 5 different colours & piping nozzles – it pipes beautifully especially using the tricky russian icing tips! The cakes were eggless as the girls had been getting a localised reaction from egg around their mouths – their mouths get red for about an hour then it disappears. 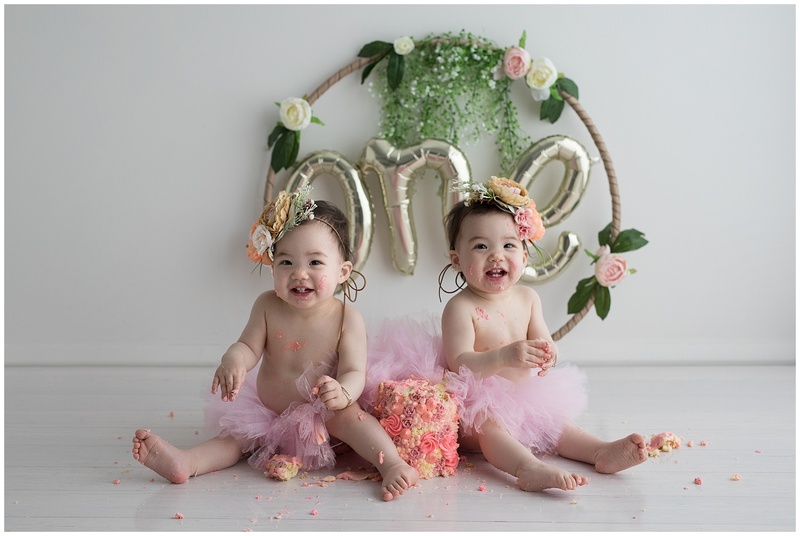 I know some people can be allergic/not allergic to eggs cooked in different ways but the girls hadn’t tried cake before (let alone cake with egg in it) so I didn’t want to take that risk with these precious photos taken! This is a delicious variation of my No Bake Mango Mousse Slice! 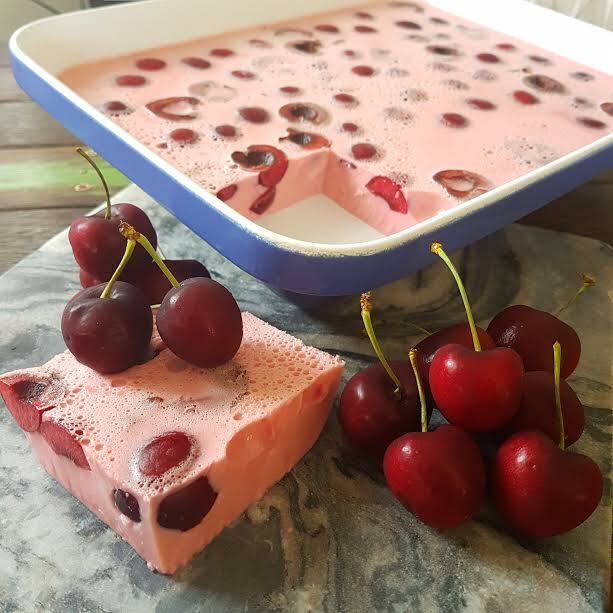 Summer is plentiful of beautiful fresh fruits, including cherries, so I thought they would be PERFECT in this no bake slice! YUM! 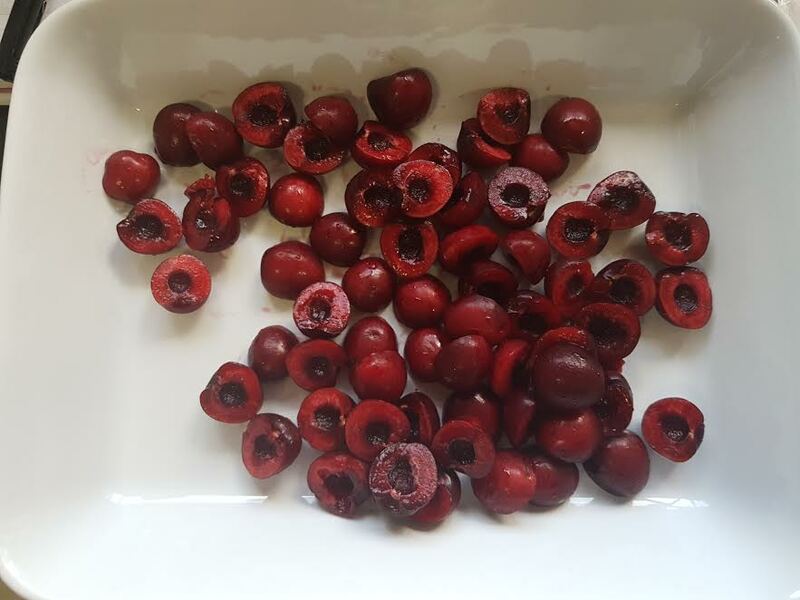 Prepare and add cherries into a large baking pan/roasting tray. 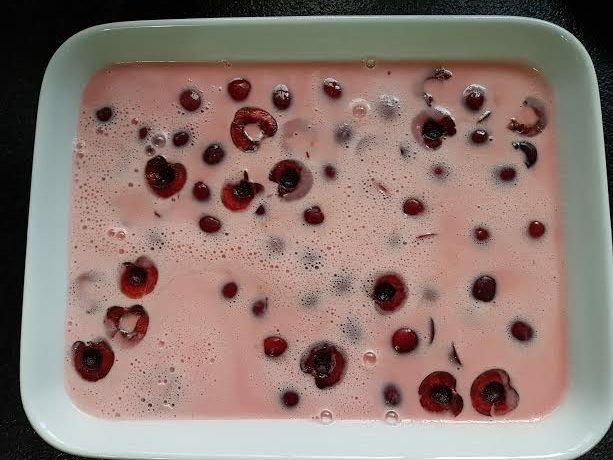 Add the 2 x jelly packets, gelatine powder and water in bowl. Heat 4 minutes/50 degrees/Speed 2. 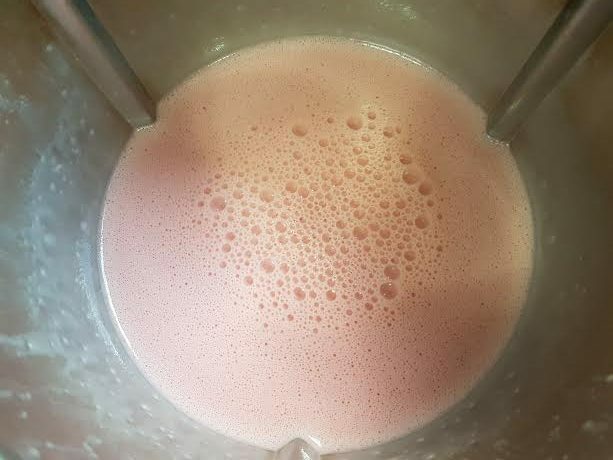 Add evaporated milk and eggs. 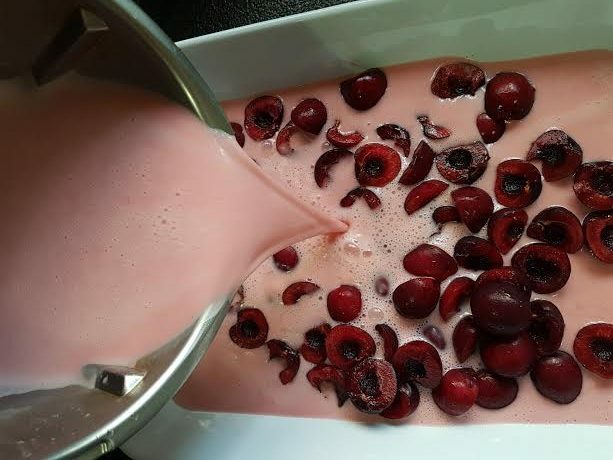 Pour over cherries and set in fridge overnight. Cut up in slices and serve chilled. Add the 2 x jelly packets, gelatine powder and water in bowl. Heat 4 minutes/50 degrees/Speed 2. Add evaporated milk and eggs. Mix 10 seconds/Speed 4. 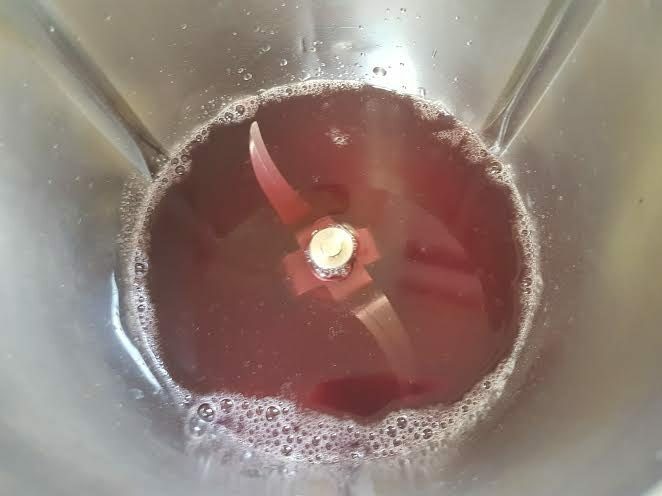 Add the 2 x jelly packets, gelatine powder in a large bowl. 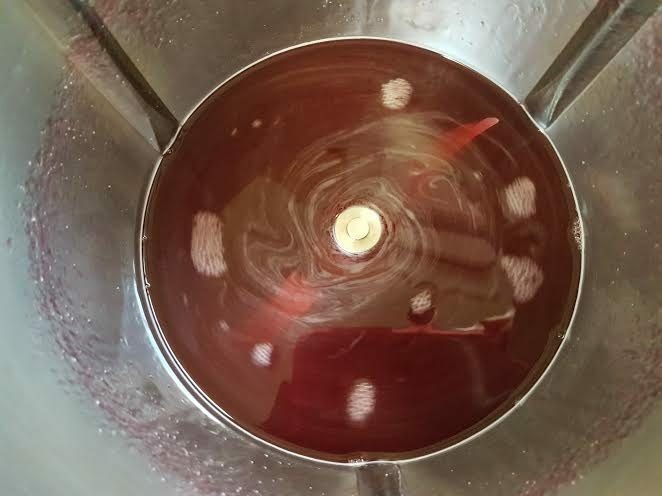 Mix with 500 grams boiling water until jelly crystals dissolve. 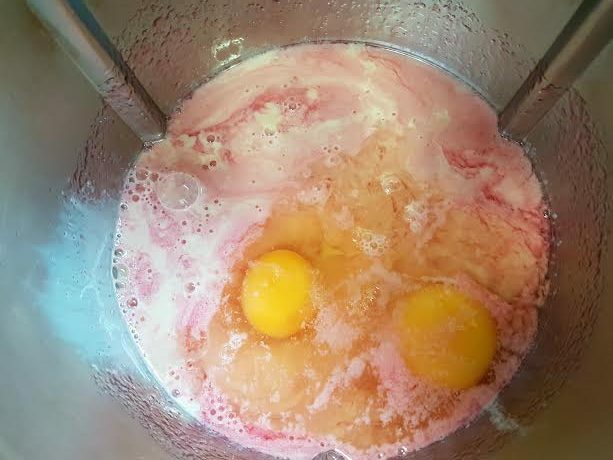 Add evaporated milk and eggs and mix until mixture well combined.